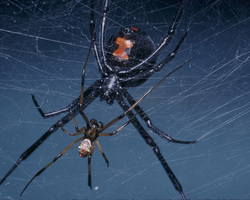 Venomous spiders in the U.S. are: the black widow, brown recluse, and hobo spiders. Even though most spider bites occur outdoors, these spiders occasionally find their way inside and can present a risk to your family and employees. Black widow spiders are found throughout North America, but are most common in the southern and western areas of the United States. They are identified by the pattern of red coloration on the underside of their abdomen. They build webs between objects, and bites usually occur when humans come into direct contact with these webs. A bite from a black widow can be distinguished from other insect bites by the two puncture marks it makes in the skin. The venom is a neurotoxin that produces pain at the bite area and then spreads to the chest, abdomen, or the entire body. The brown recluse spider, also known as the violin spider or fiddleback spider, is most commonly found in the Midwestern and southern states of the United States. It is brown in color with a characteristic dark violin-shaped (or fiddle-shaped) marking on its head and has six equal-sized eyes (most spiders have eight eyes). Brown recluse spiders are usually found in secluded, dry, sheltered areas such as underneath structures logs, or in piles of rocks or leaves. If a brown recluse spider wanders indoors, they may be found in dark closets, shoes, or attics. 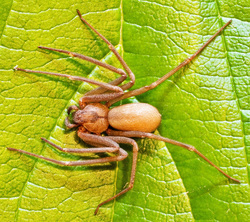 The brown recluse spider cannot bite humans without some form of counter pressure, for example, through unintentional contact that traps the spider against the skin. Bites may cause a stinging sensation with localized pain. A small white blister usually develops at the site of the bite. 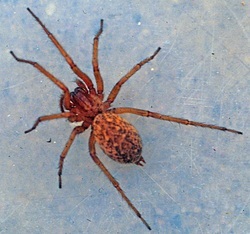 The venom of a brown recluse can cause a severe lesion by destroying skin tissue (skin necrosis). This skin lesion will require professional medical attention. The wolf spider's appearance consists of a brown or dark coloration with bristles on their legs and body, which makes some species look a bit like tarantulas, but they are in fact very different. As there are many different wolf spider species, their appearances vary a lot. Wolf spiders depend on their sight and have eight eyes in total, and of these are two very large. Above them, and laterally, they have two smaller eyes - and below the two large eyes, in a middle row, a row of four relatively small eyes is seen. The hobo spider is found throughout the Pacific Northwest. It is large and brown with a distinct pattern of yellow markings on its abdomen. Unlike many other similar looking spiders, hobo spiders do not have dark bands on their legs. To catch their prey, hobo spiders build funnel webs in holes, cracks, and recesses. They may be found in outdoor workplaces with retaining walls, and in foundations, window wells, and stacks of firewood and bricks. Indoors, they can nest between boxes or other storage items, on window sills, under baseboard heaters or radiators, behind furniture, and in closets. Hobo spiders do not climb like most spiders but are fast runners. These spiders are much more likely to attack if provoked or threatened. The bite of a hobo spider may go unnoticed; however a moderate to severe, slow-healing wound will develop.